The largest milk-producing state in the union has a beef with its bovines. The problem? California’s cows are farting too much – and it is killing the earth. The average California dairy cow produces about 23,000 pounds of milk and 70 to 120 kilograms of methane per year. Gov. 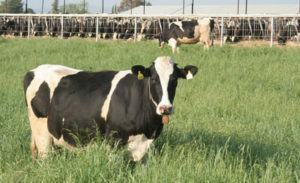 Jerry Brown, despite strong opposition from the state’s dairy farmers, signed legislation in September that for the first time regulates heat-trapping gases from livestock operations. The methane that is released when cows pass gas is the problem, the Golden State’s “progressive” government says. “If we can reduce emissions of methane, we can really help to slow global warming,” said Ryan McCarthy, a science adviser for the California Air Resources Board, tasked with implementing the new law, which aims to reduce methane emissions from dairies and livestock operations to 40 percent below 2013 levels by 2030. The dairy industry said the new law, and the many regulations expected to come with it, will not only drive up costs for California dairies, but force some to move production to other states or countries. “It just makes it more challenging. We’re continuing to lose dairies. Dairies are moving out of state to places where these costs don’t exist,” said Paul Sousa, director of environmental services for Western United Dairymen. State regulators want dairy farmers to reduce emissions with methane digesters, which capture methane from manure in large storage tanks and convert the gas into electricity. The state has set aside $50 million to help dairies set up digesters, but farmers say that’s not nearly enough to equip the state’s roughly 1,500 dairies.